The Phantom of the Fortress by Aaron M. Zook Jr.
We’d love your help. 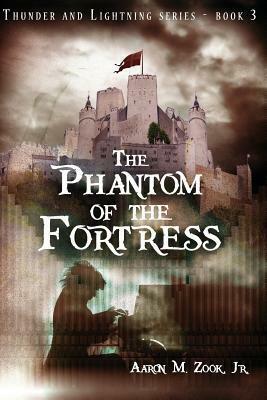 Let us know what’s wrong with this preview of The Phantom of the Fortress by Aaron M. Zook Jr.. Preview — The Phantom of the Fortress by Aaron M. Zook Jr.
To ask other readers questions about The Phantom of the Fortress, please sign up. This story is about a military family who home-schools. They have two boys, Alex and Gabe, who both own a dog - Thunder and Lightning. My favorite character was Gabe, the younger brother in the book, who is about my age. I used to have a dog named Lightning too, he is my favorite of the two dogs. The part of the book I liked the best, was when Gabe, Alex and their friends were escaping from the lion. It included quite a bit of danger and suspense and kept me wanting to read more. I think that this book is very good. The antagonist is the perfect mix of crazy and misunderstood, so he makes for a good villain. The protagonists are smart but can’t always outwit the villain, so it makes this book very realistic and intriguing. The first chapter pulls you in and makes you want to find out what will happen. It isn't really necessary to read the first two books in the series to understand the story although there are a few references in the book to previous books and the family is the same in all the books, they just go on a different adventure. So, it is helpful to read the other books to really get a better understanding, but not required. Not sure who the audience is. Very YA themes at times but then other times it feels very "wrote" and juvenile.